Temperature generally explained variation in branch and leaf biomasses, whereas stem and root biomasses–temperature relationships restricted certain age stages may not hold at broader age ranges. 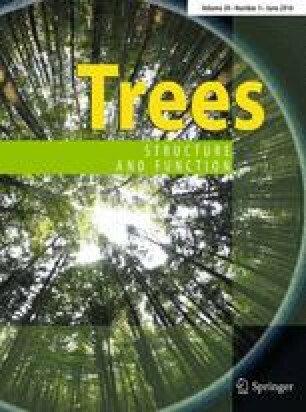 In this study, biomass data for alpine temperate Larix forest, alpine Picea-Abies forest, temperate typical deciduous broadleaved forest, temperate Pinus tabulaeformis forest, temperate mixed coniferous-broadleaved forest, montane Populus-Betula deciduous forest, subtropical evergreen broadleaved forest, subtropical montane Cupressus and Sabina forest, subtropical Pinus massoniana forest and subtropical Cunninghamia lanceolata forest were used to examine the effect of temperature on biomass allocations between organs. The data of the ten forests were classified as ≤30, 31–60 and >60 years, to test whether biomass allocations of these age group forests vary systematically in their responses to temperature. With increasing mean annual temperature, branch and leaf biomasses significantly increased in ≤30, 31–60 and >60 years and all age groups; stem biomass significantly increased in ≤30-, 31–60- and >60-year groups, but no significant trend in all age groups; Root biomass significantly increased in 31–60, >60 years and all age groups, but had no response to mean annual temperature in the 30-year group, which suggest that root biomass allocation in response to temperature is dependent upon forest age. We conclude that temperature generally explained variation in branch and leaf biomasses, whereas stem and root biomasses–temperature relationships restricted certain age stages may not hold at broader age ranges. We are grateful that Dr. Luo provided the precious information for our study. This research was partially supported by Foundation of Guangdong Forestry Bureau (Nos. 4400-F11031, 4400-F11055).